Set in the outskirts of Rome, teenage pals Mirko and Manolo joke around on the drive home after the end of their pizza delivery shifts. Distracted, they don’t see the pedestrian wandering into the road. It is an accident that will set them on a path to crime, fast money, and corrosive danger. 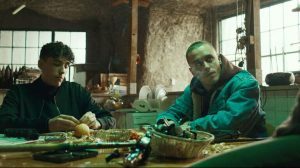 Written and directed by the self-taught twins the D’Innocenzo brothers, this stylish debut is not the slick Gomorrah knock off you think you are in for. Instead its a probing, psychologically acute study of two young males losing their way.